Manchester United came through as comfortable 4-0 winners at Yeovil Town in our FA Cup fourth round tie at Huish Park this evening, just as we predicted earlier today. Marcus Rashford opened the scoring five minutes before half-time when he gambled on a defensive mistake from close range. Ander Herrera’s fine finish on the hour put the game beyond Yeovil’s reach. We had a few chances to add to the score before Jesse Lingard made it 3-0 in the final minute and Romelu Lukaku tapped home in the final touch of the game. The League Two side had created a couple of chances early on before we took control of the game and ran out handsome winners in a professional performance. Forced into a couple of decent saves early on before cruising to a clean sheet in the end. Jordan Green caused Matteo Darmian a few problems early on and even forced a save at the legs of Sergio Romero. The Italian lacked the pace and positioning to match up to the Yeovil winger but fortunately they didn’t get too much possession in our final third after the opening 20 minutes. Looked a bit off pace in his first start in the three weeks. However, Francois Zoko and Sam Surridge were kept quiet which was the main job of the centre-backs. Marcos Rojo was excellent in defence, making blocks, tackles, interceptions and a number of clearances early on after a bright start from the League Two side. Excellent assist for Lukaku’s goal in the final seconds. Comfortable defensive performance in what was Luke Shaw’s sixth start in our last seven. Didn’t put any crosses into the box from out wide in a conservative performance but he did what he needed to do in laying the ball off to Alexis Sanchez instead. Saw a lot of the ball, looked after it and finished the game off with a fine finish across goal into the far corner on the hour mark. Worked hard off the ball to win it back as he always does. Nice to see Michael Carrick back in the starting lineup. The experienced midfielder sat in front of the back four and was his usual self in possession in playing a simple game to keep possession for our side. Another good performance from the youngster who won his fare share of aerial battles, tackles and looked after the ball. Offered good protection of the back four as well as winning the ball back for us. Matched up to the League Two side physically but picked up a yellow card late on and committed a silly foul shortly after. Saw about half the amount of possession as Alexis Sanchez on the opposite wing; Juan Mata was useful in the final third without creating much and saw a good opportunity blocked. Excellent striker’s instinct to gamble on a defensive mistake to take advantage in scoring our opening goal. Marcus Rashford saw another effort well blocked to win a corner. His pace often promised to cause Yeovil problems but the service into his feet wasn’t always great this evening. A man of the match performance on his Manchester United debut. All that was missing from Alexis Sanchez this evening was a goal. Everything went through the Chilean who created a number of chances for his new teammates this evening. Unfortunately Yeovil decided to hack the new arrival down time and time again. Romelu Lukaku (26 mins) N/A – Another appearance from the substitutes bench in this season’s FA Cup for Romelu Lukaku and another late goal as the Belgian tapped home with the final touch of the game. Jesse Lingard (19 mins) N/A – Scored a cracking solo goal in the final minute by running through a number of defenders before firing into the far corner for what was Jesse Lingard’s 12th goal in all competitions this season. Angel Gomes (3 mins) N/A – A late FA Cup debut for the 17-year-old. 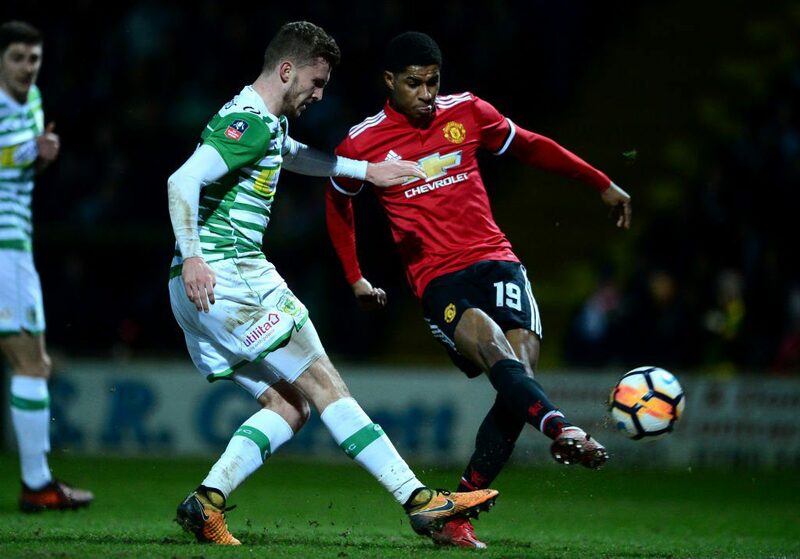 Seconds after making his entrance Angel Gomes took on a Yeovil defender in the penalty area before firing into the side netting from a tight angle.